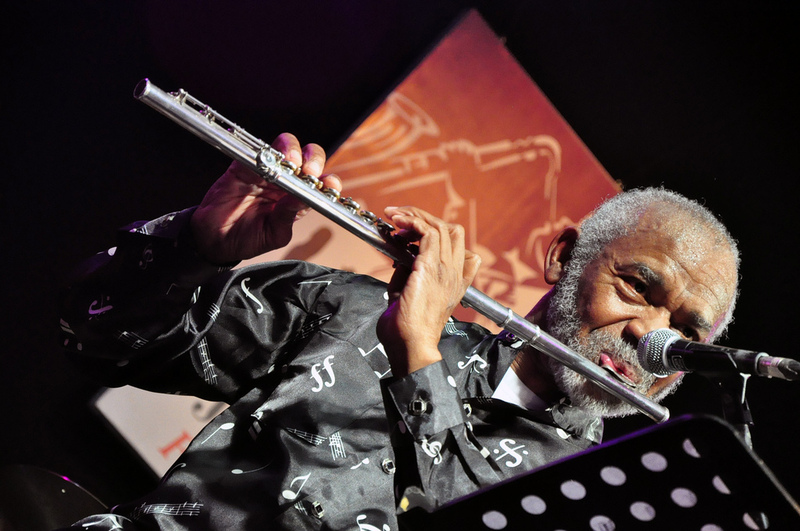 Mention the name of flautist Hubert Laws to jazz fans of a certain bent and it’ll elicit an expression of appreciation and affection – his name is synonymous with the kinds of cool jazz/Latin/funk exemplified by the CTI label, where he made a few fondly remembered albums, as well as making key contributions to Gil Scott-Heron’s ‘The Revolution Will Not Be Televised’ and Jaco Pastorius’s famous 1976 debut. But he is also a classically-trained virtuoso and also the recent recipient of an NEA Jazz Master award. Tonight, at this well-attended London gig in an outhouse of the Barbican Centre, he was special guest soloist with the Smithsonian Jazz Masterworks Orchestra, a fine big band celebrating the musical and social history of jazz under the auspices of conductor/artistic director/alto saxist Charles Young. The program was rich and varied; the opening ‘Chachanita’, composed by Michael Mossman, burned with an Afro-Cuban groove and featured some fabulous trumpet duels between Kenny Rittenhouse and Tom Williams. Toshiko Akiyoshi’s sweeping ‘Song For The Harvest’ was broken up by a great ensemble flute interlude, while the Django classic ‘Nuages’ featured some lovely Jim Hall-style guitar from Marty Ashby. Arrangements of Ellington’s ‘Queen’s Suite’, Bernstein’s ‘Times Square Ballet’ and Victor Feldman’s ‘Seven Steps To Heaven’ were subtle and original. Laws appeared for the classic ‘Undecided’ and immediately produced an amazing solo, full of strangely familiar, always logical melodies. ‘My Time Will Come’ was irresistible soft funk built on a lovely bass vamp, while ‘Mean Lene Suite’ and the Stan Kenton-composed, Don Sebesky-arranged ‘Malaguena’ were gorgeous. Laws summoned a round of applause for the soundman, saying that ‘playing a flute with a big band is like a fly trying to be heard over a Boeing 747’, but the dynamics of this unit were just sublime, going from whisper to shout in a heartbeat. The flautist also introduced each tune with interesting anecdotes and philosophies, including a lengthy treatise on the power of improvisation versus the rigid perfectionism of the classical world, outlining the benefits of each approach and their relevance to life. It was impossible for this writer to resist compare this gig with some of the recent high-profile big-band gigs in the capital – the recent BBC Proms and ‘Monk At Town Hall’ event during the 2017 EFG London Jazz Festival came to mind. Frankly, it was chalk and cheese. This band swung hard, grooved hard and were blessed with three or four world-class soloists. The Smithsonian Jazz Masterworks Orchestra return to New York City in May with guest vocalist Kurt Elling. Don’t miss.